Up to €1,000 BONUS + a €500 New Player freeroll ticket! 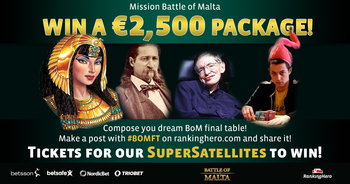 The Blog&Go contest, with a €1,500 package to Battle of Malta to win, is now over! No more suspense, here are the 9 qualified for our private Blogger Final Tournament that will decide who will be the official RKH reporter in Malta! Be ready for the tournament on Monday 26 October! Please contact @Ina Rkh or @Rémi Rkh with your Betsson nicknames and link your accounts if you haven't already. If you still don’t have a Betsafe/Betsson/TrioBet/NordicBet account, click on the “Download” button at the top of this page. Don’t forget the Final Satellite, on Sunday 25 October, that can win you the OTHER PACKAGE, worth €2,500! See you soon on Betsson Group! Thanks RH! Awesome, good luck everyone! Road to Malta Final Mission IveyRead: The results! For the last mission, RankingHero and Betsson Group offer €100 in online tickets! And €1,000 for “à la carte” Lifestyle package activities. And the winner is… @Skilful! Congratulations! You finished 1st in likes and the RKH jury decided to award 3 points to your post! 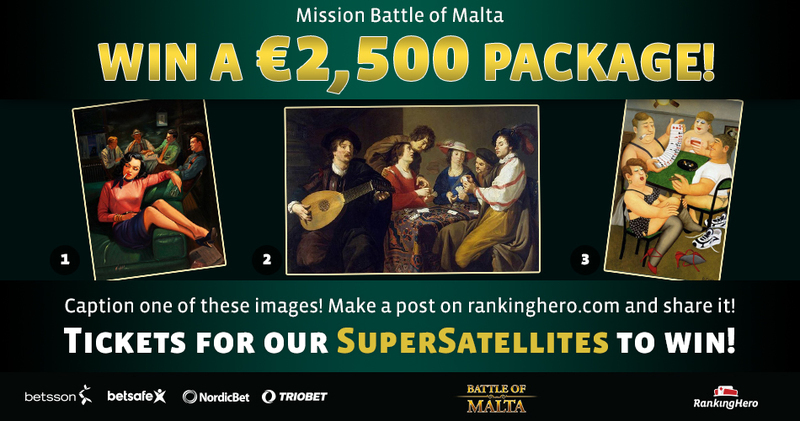 You win a €50 ticket for our Final Satellite to Battle of Malta on Sunday 25 October! 14 likes + 2 points: 16 points. 10 likes + 1 point: 11 points. You all have one more chance to qualify to the Final Satellite! €200 ADDED + a €50 ticket for the Final Satellite! Please note: The Final Satellite is an open event. So if you want to try your luck to win the exclusive €2,500 package, join in! It will take place on 25 October at 8:15 UK and will be live on Twitch! Nice one. @Skilful you planning on selling package again if you win? @Mark Duguid He cant sell thatone if he wins, he said in his first competition entry he will take one of us with him with the bonus points to spend that come with the package. Nice one congratulations all, thanks ranking Hero! Blog & Go Contest Part 3: Interview the BOM winner! And you get to be the official RKH reporter in Malta! All you have to do is qualify to the Bloggers Satellite through our three special contests. 3rd step: The 2015 Battle of Malta champion has just been crowned! Make an exclusive winner’s interview for RankingHero. Who is she/he? 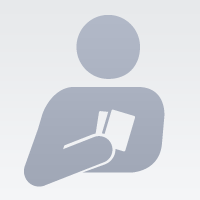 A poker pro, an amateur, an RKH member? What was the winning hand? Is the winner boastful and arrogant or humble and full of praise for the last opponents? Does she/he prefer chocolate or vanilla ice-cream and who is their favorite Game of Thrones character? Feel free to ask these or any other questions and show us your interviewer skills! Be fun or very professional. It’s up to you! Post it on RankingHero with the hashtag #BOMinterview. You have until Monday 19 October. 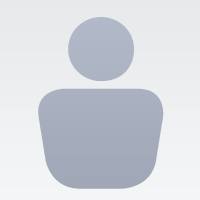 Share it on social networks and invite your friends to like your post on RankingHero. Every 10 likes you get on RKH will earn you 1 point! Then the RKH jury will evaluate the top 10 submissions and award 1 to 10 points for content and presentation. At the end of the 3 contests, the 9 members who earn the most points will participate in a private SNG to decide who gets the €1,500 package to Malta! Blogger Contest Part 2: Results! In this challenge, you were asked to describe the Battle of Malta VIP Party. And we can already say that whoever goes there as the RKH reporter, we’re going to have some fun reports! @DecoGTX will send us blurry pictures of all the drinks he had. @Jonny2192 will tell us about his dreams after taking the wrong kind of mushrooms. And @Skilful will gather all the juicy gossip but will unfortunately not be able “to repeat it here in print” So maybe we’ll have to rely on our new star reporter this week, @Kat Arnsby. Click here to discover the 3rd and last challenge! 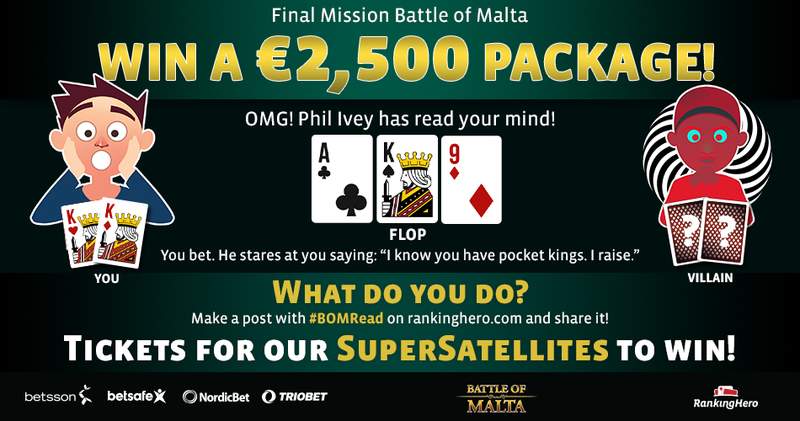 Road To Malta - Final Mission: Ivey reads your mind! Last mission to win tickets on Betsson Group rooms! And this mission can qualify you directly to the €50 Final Satellite where you will be playing for the VIP Package. In this mission, we confront you with the great Phil Ivey who seems to see through your cards.Tell us your reaction! Be strategic, be fun, or be both, whether you withdraw or take on the battle with the best player in the world! You are in the Battle of Malta Main Event, Day 2. You have 35 blinds. @Phil Ivey has just sat down at your table. The dealer is kind to you and gives you K♥K♦. You raise 2.5 BB from UTG. Phil, UTG +1, calls and all the other players fold. You bet (bet size is up to you). He stares at you for a few more seconds and pushes a pile of chips in. Is he trying to bluff you? Did you say your hand out loud without even noticing? Does this man really read minds? And if so, is it legal? Shouldn’t you call the floor manager? Or are you going to beat the best player on Earth? Post your entry on RKH with the hashtags #RoadtoMalta and #IveyRead. Impress the jury with your reasoning and/or make us laugh to win bonus points! The entry with the most points wins this mission. Share this Facebook post and enter a random draw to win online tickets! €100 to win, including a ticket for the €50 Final Satellite on 25 October! You have until next Monday to participate! Mission 4 - Dream Final Table: The results! In this mission, you had to invite 8 people to join you at the Battle of Malta Main Event final table and you had complete freedom to summon anyone - from the Poker Hall of Fame and the Heroscore Top 10, through celebrities and public figures, to the pantheon of ancient heroes and rulers! We have TWO finalists sharing the first place this week - @Mark Duguid and @Shyvatrip! Both demonstrated great courage and did not hesitate to invite some of the very best poker players of all-time, both made an excellent presentation and explained their choices well. The remaining prize pool was not any easier to share out. Here are the finalists with most likes and the best illustrated and well argumented lists of invitees! @Santo Abate ranks third by likes but with so many jury members at his final table we could not risk accusations of corruption and therefore denied him any extra points The 17 pts he got through likes still earn him a €5 prize! @Sean Connor got a bigger bonus for being brave enough to invite four of our favorite female players to his dream final table. Sweet dreams, Sean, you win €5! Finally, congrats to the random draw winner - @Bnasp! You win €5 in tickets! Thank you all for your participation and we hope to see you equally inspired in our next - and last - #RoadtoMalta mission! sorry about my ignorance but where are those 40euros going to? ?can i grind them for charity? out of curiosity how many points did i recieve ? @Shyvatrip grats, they are going into betsson account / (betsafe) if you are in UK. 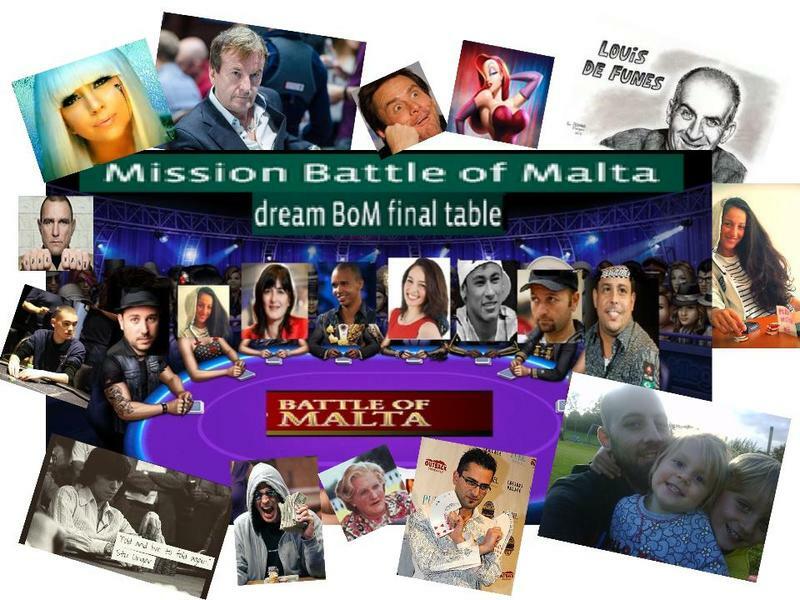 Road to Malta - Mission 4: Your Dream Final Table! 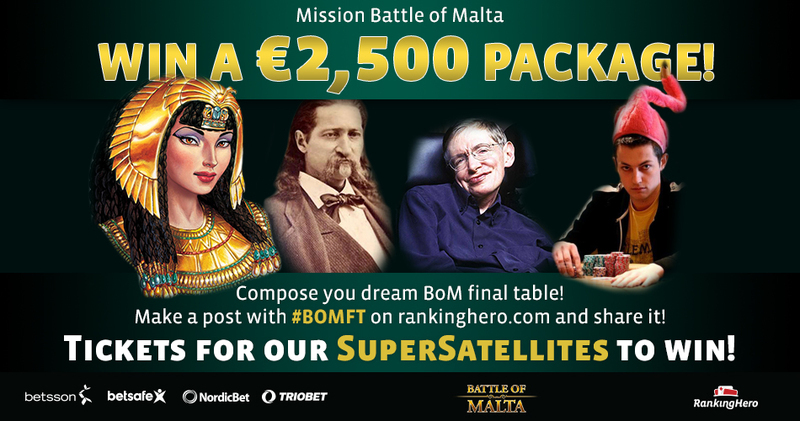 In this mission, you are to compose your own 2015 Battle of Malta 9-handed Final Table (including yourself, of course )! You can invite anyone to join you - living or historical public figures, famous pros, celebrities, even RankingHero members! €100 TO WIN on the way to the €2,500 package! The jury will award bonus points for presentation and to those who explain their choices! Submit your list of 8 finalists in a RKH post with the hashtags #RoadtoMalta and #BOMFT. You have until next Sunday to participate! Good luck and don’t forget you can also take the BLOG&GO Road to Malta! Find info about the second challenge HERE. Mission 3 - Caption this pic: The results! In this mission, you had to choose one of the images below and create a funny caption! Congratulations, you win €40 in online tickets + a ticket for a Supersat! You also win €5 in online tickets! Come back tomorrow for a new mission. Congrats @William Calder and the other winners. GG all watch out for the new mission..coming in few hours ! Blog & Go Contest Part 2: The VIP Player Party! All you have to do is to qualify to the Bloggers Satellite through our three special contests. 2nd step: Imagine and describe the VIP Player Party during the Battle of Malta. Was the party wild and exciting or too fancy and stiff; cool or too cold; fun or lame? Give us all the juicy details and bits of gossip you heard as the RankingHero reporter! Post it on RankingHero with the hashtag #MaltaBOMParty. You have until Monday 5 October. Blogger Contest Part 1: Results! This afternoon we launch the second challenge! So if you still don’t have an account, register now on one of our partner sites: Betsson, Betsafe, Triobet, or NordicBet. Go to this page and click on the button “Download now” to get our special bonuses! Deposit €20 or more before 10 October with the "Download" button and get a FREE ENTRY to a SuperSatellite to Malta (no clearing requirements)! Once your account is created, join our “Play & Go” festival, with another package to Battle of Malta to win, worth €2,500! Thanks! Look forward to the next challenge, good luck everyone! And here is the next challenge!